Members of one of Hull’s longest-established graffiti collectives are bringing their unique artwork to the Fruit Market. Graffiti artists VRok, Nohone, Peak and EP1KR – together known as the DFC crew – will be showcasing a collection of graffiti styles developed over almost two decades of painting together, in an exhibition at 66-68 Humber Street this weekend. The Humber Street Graffiti Takeover will include large-scale prints of murals that the artists have painted together over the years, brightening up some of Hull’s least-loved, derelict outdoor spaces. Also on display will be original canvases of previously unseen work, a new print “’zine”, a range of clothing and a unique new mural painted exclusively for the event. 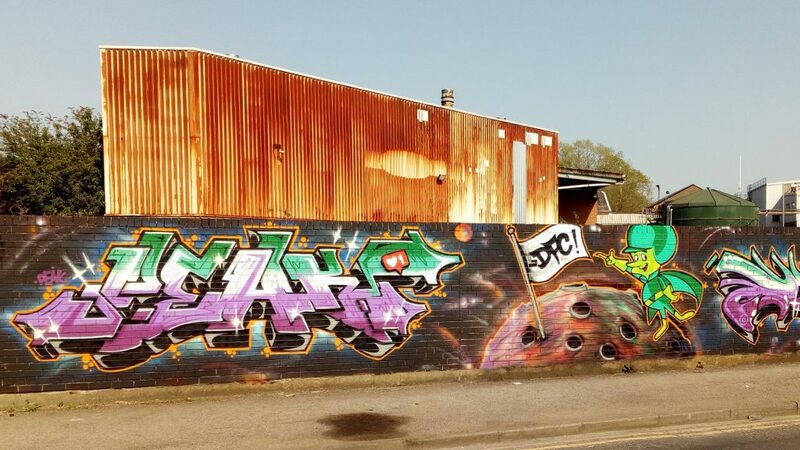 The move to make underground art forms such as graffiti and street art more visible and accessible to the public is a trend that’s picking up speed in Hull, thanks in part to the popularity of the city’s sprawling outdoor legal graffiti space, Bankside Gallery. The area became a hotbed of street art after anonymous street artist Banksy painted a mural on the raised Scott Street Bridge last year. The artists said they were hoping to use their exhibition to further dispel some of the myths and preconceptions about graffiti and its artists. Artist Peak said: “In Hull, many people’s eyes were opened to graffiti as an art form by City of Culture in 2017 and by the emergence of Bankside Gallery last year. Artist VRok said: “This venue in Humber Street is really well suited to us – we’ve spent the past 10 to 20 years filling derelict spaces with our work, so I like the idea we’re going to be filling an empty space in Humber Street with our work for one weekend only. Another member of the collective, Nohone, said: “The show is a bit of a celebration of our work – we’ve been creating these walls for years and we try to make every wall better than the last one. In 20 years’ time, I’ll look back on this and be really proud of what we did. 66-68 Humber Street is becoming well established as one of the Fruit Market’s most diverse and welcoming creative and artistic spaces. It has already hosted exhibitions by Ground Gallery and Feral Art School, as well as the Humber Street Festival of Christmas that saw local bands, craftspeople and independent traders come together under one roof over a number of weekends. The venue has a mixture of exhibitions and events in the pipeline, which is part of an ongoing programme to open up the Fruit Market’s vacant spaces to independent Hull-based artists and cultural groups. The next events due to occupy this flexible space available for use by Hull’s artistic community are a premier of a film documenting Hull’s skateboarding scene, called Paradise Island, which is presented by Hull artist Cheaplife and a residency by the highly-regarded contemporary dance group Hull Dance. The venue is being made available to the graffiti artists free of charge by Wykeland Beal, which is working in partnership with Hull City Council to regenerate the Fruit Market. The rejuvenation of the waterfront district has stimulated the growth of a community of independent creative businesses, galleries, retailers, restaurants and bars, with more openings due in the near future. Natalia Cleary, Wykeland Group Events Manager, said: “66-68 Humber Street works really well as a pop-up arts space and we’ve been really encouraged by the response to its use so far by local creative groups. 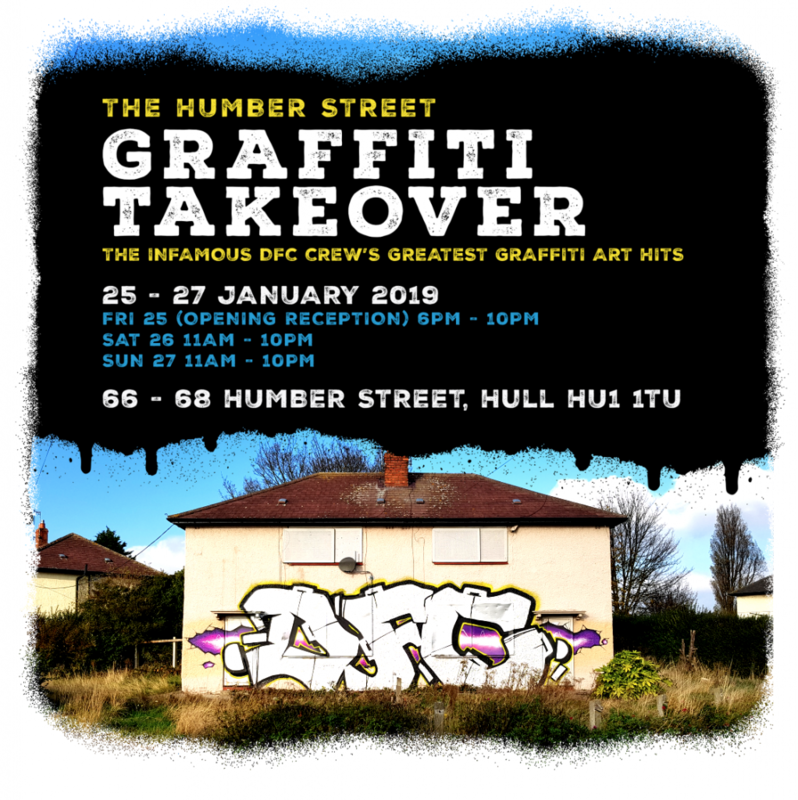 The Humber Street Graffiti Takeover in open to the public at 66-68 Humber Street from 6pm on Friday, January 25, to 10pm on Sunday, January 27. Be the first to comment on "Graffiti artists take over Humber Street creative space"